Excellent service. Very pleased with my watch, great value and accurate description. It is a large strap, although a unisex watch it may be a little too large if you have small wrists, mine are large for a female and I use the penultimate setting. Overall very pleased. I love the digital display timer, the bright colour, the design and the good price. This is a nice pratical watch. Bought this watch as it was an alternative styling but identical watch to one I bought in 2001 and is ideal for sports wear - light ruggged reliable and weather proof - great for biking with. The price was about the same as I paid in 2001 too - amazing value for money! Excellent watch great colour and functions. Cheap and functional. Exactly what I required. Fantastic value for money. Really comfortable to wear and plenty of functions. An extremely eye catching colour. I bought this watch as a replacement for one by puppy ate! This turned up within 2 working days which was superb. The colour of the strap is very accurate from the website so dont be surprised when it turns up! The watch is very basic but this price one should expect nothing else. That said, it does exactly what it should. It tells the time in digital form, it provides the day and date function and is easy to change. This is described as a unisex watch and I was concerned that it might appear huge on my lady wrist, it doesnt. Also the strap is more than good enough to fit both a male and female wrists. Really pleased with this watch. Bought for my sons 13th Birthday. He is really pleased with all its functions and how it looks. Purchase was quick and easy and delivery was fast. Will use Watchshop again. Great little watch. Excellent value. And a superb work watch. Tough plastic and very light weight. Great sporty looking watch for a very good price. Was able to figure it all out without instruction although full details are of course supplied. Very pleased with my purchase. Straightforward, easy to use, robust watch. Purchase the watch for myself to wear to Sheffield Steelers game as the club plays in Orange. Just, what I wanted, Colourful and works well. It tells the time, has a stop watch and light.What more can I say? COmpany were brilliant - so quick and reasonably priced. Really pleased with the watch, and really pleased with price paid. Bought for a young man, really fits the bill. Initially, I was concerned the size of this watch would be massive for my nine year old son, but I need not have worried - the strap adjusts beautifully to his slim wrist and even the watch face size is not as big as it looks in the picture. He adores the vibrant orange colour and he found it easy to program and use. The light is an added feature that he finds useful and to date has arrived at his saxophone lessons on time due to the alarm! Great watch, just what I needed to go with my new work uniform. Easy to use. Good strong strap. Excellent product, easy to use features, display is clear and numbers easy to read. The colour is a true orange. Ideal size for my teen son, nice weight to the watch. Bought an expensive G shock & wanted a cheaper option for every day use & work. Nice colour, all in all a good watch! The process to order was nice and easy, The gift arrived in time and in mint condition. I have to say that the wrapping and the tag was not the quality I was expected and if I could have seen an image or a sample of the tag earlier, I would probably not choose this add on. Dont get me wrong, it is not over priced but the quality was low. I might use this website again. New watch for my 11 year old starting High School. We cut the end off the strap but there were plenty of holes to do it up properly. An orange watch would not be my personal colour but Im reliably informed its cool for school. Bought this for my nephew and he loves it. Very vibrant color with the world class brand to rely on.Good place to buy watch, really fast delivery. Good product exactly as pictured and perfect for the job of timing my runs and like the light for night time! Loving the funky orange too. Bought as a gift for my son, he absolutely loves it. 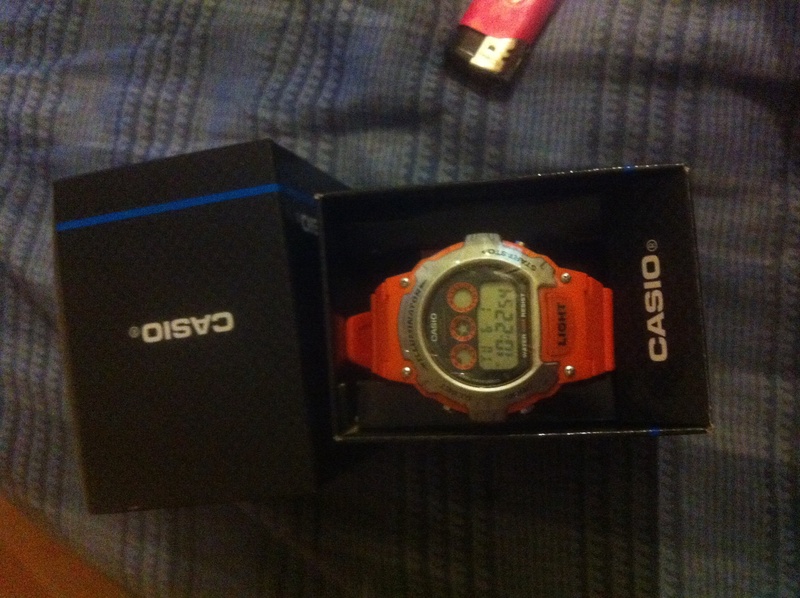 Its orange which was his only stipulation, has an alarm and stopwatch. The only thing I would say is that the date is in US format i.e. Day of Week, Month then Day not Day then Month as expected in UK and I cant find anything in the user guide to change this. Even with the above it is a great little product and looks capable of taking the knocks a 13 year old is likely to give it. Great watch in a vibrant colour. Superb value for mony and useful everyday time piece. The watch is of excellent color and very attractive. It looks a bit childish but still it looks great on wrist. It goes well with shorts or jeans with T-shirt. This is my first ever purchase on WatchShop and am completely satisfied and very impressed. I have told all my friends and family about how impressive WatchShop really is. As for the watch itself, I couldnt be any happier. I have got a very skinny wrist and it fits perfectly. Given half a chance, Id buy the same watch again. This is a lovely watch especially for the price paid. 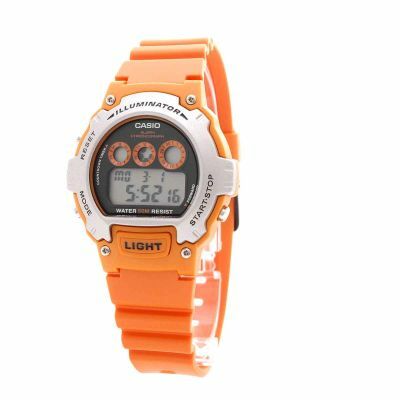 I bought it for my son mainly because I have a Casio watch and love it and the colour my sons favourite colour is orange. It is good quality expect no less from Casio, well made and more importantly keeps good time. Unfortunately the alarm does not get him out of bed but neither would a bomb but the other features he loves. Service from Watch Shop is as always excellent , wouldnt go anywhere to buy my watches now Ive discovered them. the watch was of good quality and colour make. It was truly a bargain for its price. very classic and can be chic or manly at the same time depending who wears it. An ideal watch for a teenager, trendy and very good value for money,very easy to set up and to use. Great watch , love the colour. Watch arrived within 24 hours of ordering. Would buy from this site again. This is a nice watch for the money as you would expect from Casio. The orange is a matt effect and a shade duller than the plastic carrier bags from a well know UK supermarket. The digital display for the time is not that large: fine for regular wear but possibly not the watch to buy if you want a watch to wear while running for example. Strangely the buckle on the strap is black not orange. I think Casio could also improve the look by making an all-orange version without the grey perimeter on the front. Watch is lightweight and good size not too big. Great Product. I purchased it for the stop watch facility to assist my jogging. This was a present for my little nephew. Fantastic colour , easy to read screen and waterproof. An amazing present for a 12 year old kid. Very pleased with the item. Very happy with this watch. It has a nice solid feel and is of good quality. Id have been a little happier if the screen was scratch resistant, as its already got a scratch on it. A nice purchase all the same. The watch is fantastic value for money - I got the orange version for my 15 year old, who loves it. Has an alarm, timer, light etc...he wanted a watch with these things to go on an expedition to China next summer. The watch looks far more expensive than it was and is a really great buy. Thank you! You have made a young boy very happy and all for only £15! Reliable in its simplicity. A great watch available in a good selection of colours. Whats not to like at this price! great watch, great colour, my 10 year old received it for his birthday,loves all the extras, light,alarm and stopwatch. plus side fits a small wrist easily, isnt bulky , its lightweight and looks more than its value! Within two days of wearing the watch, the orange strap accumulates black marks on the strap which doesnt disappear even after a thorough wash. Very disappointed with the watch. Nice quality watch, good colour and features. Did not disappoint and the person I bought it as a present for seemed very happy with it. Good practical watch bought for our son. Easy to use, good features. Bright orange colour. Great watch. Lovely colour. Quality really gooD. Excellent value for money. Clear easy to read dials. Great watch for the money. Just wanted something cheapish, waterproof & bright to wear when fishing. Very happy with it. And also great service from the WatchShop, thanks. Good watch, does exactly what it needs to, very easy to use and set. Good functions, ideal for timing, good alarm function. well made would buy again excellent service.Nice design good looking watch. in the dark ie good light elumination . Excellent. Simple and effective. Basic functions easy to understand and set. Colourful, bright and modern. Many appreciative comments made when wearing. Its really light so its quite comfortable. the dial looks a bit bigger when u see it in this site but other than that its quite cool. Need a reliable and simple watch that told the time, this watch does exactly that. Nothing fancy but has all the basic and casio reliability. The colour is one that also stands out!